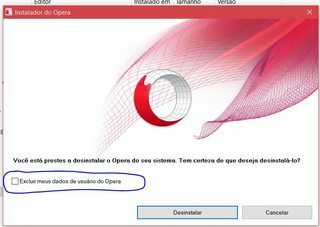 Un-installing Opera: How to remove the settings? My installation of Opera is well and truly broken. Have tried everything to fix it, but it keeps randomly erasing everything but book marks and I can't figure out whats going on. Is there anyway I can completely uninstall the package. To try a fresh install. Everytime I try to uninstall it I find it keeps all the previous settings. I've tried Revo uninstall, but it makes no difference. Is there a way Opera can completely uninstall so that I can start afresh? Are you checking the option to delete your data? Even if you select all folders in the list and remove them? There is never ever such an option - I'm using the latest version of Opera. yes. I've tried Windows uninstall and Revo uninstall and checked all folders and checked all registry entries, nothing gets deleted.... the passwords, extensions, bookmarks - it is as though these things are not touch in anyway, except when Opera randomly crashes and then they get totally wiped out. Unless you have a standalone (USB) installation, the user settings of Opera will not be in the Opera program files folder, they will be in a folder under your Windows user name. If you can run Opera, use the "About" dialogue on the Opera menu to see where your profile folder is. If not, un-hide hidden files in Windows Explorer, and browse to your personal user-named folder in C:\Users, and search there for any Opera folders. They will probably be in \AppData\Roaming and \AppData\Local. When you find these folders, delete them and your settings will be gone so you can do a clean install. So you don't see that option when you un-install Opera? In English it should say 'Remove my Opera's user data'.